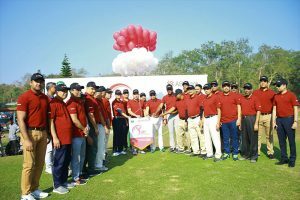 AB Bank 28th President Cup Golf Tournament was held at the Bhatiary Golf & Country Club with much enthusiasm and festivity on Friday, February 08, 2019. Almost 200 golfers took part in the event which was sponsored by AB Bank Limited. Major General S M Matiur Rahman, afwc, psc, GOC, 24th Infantry Division & Area Commander, Chattogram and President, Bhatiary Golf & Country Club gave away prizes among the winners as the Chief Guest. Special guest. Mr. Tarique Afzal, President & Managing Director (CC) of AB Bank Ltd. along with other executives of the Bank were present on the occasion.